But stories about the questionable colour of the tap water, although strange for Westerners, are not that unusual for a country where people who can afford it drink bottled water – and are more of a concern for Sochi residents than people who will be there for only a few weeks. The problems encountered show the difficulties of taking a city with limited modern infrastructure – and of building it into a modern Olympic calibre city in only seven years. The response of Deputy Prime Minister Dmitry Kozak was to argue that ‘we’ve put 100,000 guests in rooms and only gotten 103 registered complaints and every one of those is being taken care of’. But unfortunately, while attempting to clear up one controversy, Kozak created another. When discussing plumbing problems he said ‘we have surveillance video from the hotels that shows people turn on the shower, direct the nozzle at the wall and then leave the room for the whole day’ – prompting headlines such as ‘Russia’s Deputy PM: The Hotel Showers at Sochi Are Fitted With Spycams’ and leading to a denial from a spokesman that Russia was spying on people’s showers. While those stories were circulating, NBC News’ Richard Engel was reporting on the high potential for being hacked while in Sochi. Engel and a computer security expert established a fake online profile and the reporter saw both his mobile and computers quickly hacked. The story drew worldwide attention. Less attention, was paid to the fact that the story was disputed. As PC Magazine points out, the NBC story, which was done in Moscow not Sochi, saw Engel download a hostile Android phone app – something that could have been done anywhere – with none of the devices were protected by any anti-virus program. The honour of lighting the Olympic Cauldron was given to State Duma members for the ruling United Russia party: Irina Rodnina, a three-time Olympic gold medallist in pairs skating, and Vladislav Tretyak, who won gold three times as goaltender of the Soviet ice hockey team. Putin denied involvement in their selection but rumours circulated in Russia that two-time Olympic rhythmic gymnastics medal-winner Alina Kabaeva (also a State Duma member – and supposedly Putin’s girlfriend) would light the cauldron. The inclusion of Rodnina was badly received by some Americans because of a tweet she sent (and subsequently deleted), about President Obama in September which was considered racist. For some, Rodnina’s participation was a political statement but the President of the Sochi 2014 Organizing Committee, Dmitry Chernyshenko, said Rodnina was chosen because of her Olympic record. The International Olympic Committee appeared to distance itself from the debate over Rodnina’s role. A spokesman stated that it was ‘clearly not the IOC that chooses torch bearers. 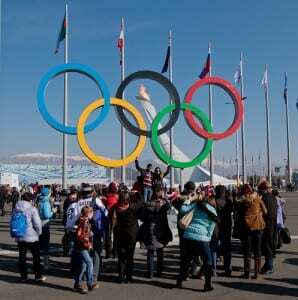 During the Opening Ceremony, when one of the snowflakes which was supposed to become an Olympic ring failed to work properly, Pervyi Kanal – Russia’s main TV channel – quickly decided to replace live coverage with rehearsal footage, arguing that it was preserving the integrity of the Olympic rings. Photos of Putin watching the ceremony on television and seeing all five rings before he entered the stadium underlined the difference between the Russian broadcast and the one seen by the rest of the world. Despite the controversies of the preceding months and the final week, the Opening Ceremony itself received positive reviews. The Guardian spoke of ‘an elegant, mesmerising and occasionally surreal ceremony’. 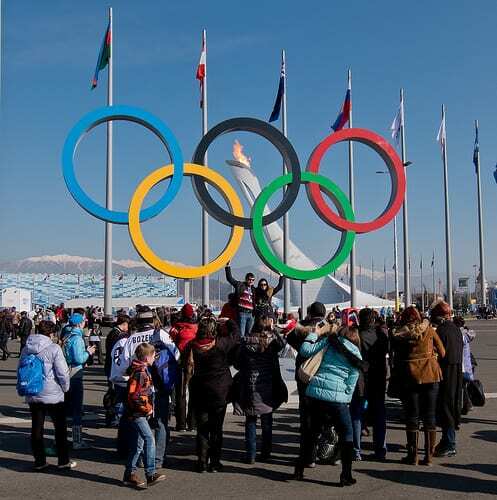 Now the Sochi Games are underway, the headlines will focus less on the problems confronting the Winter Olympics and more on athleticism and the successes of individuals and countries. Although the negative stories of the past week and the controversies that plagued the Sochi games from the outset are unlikely to be forgotten, Olympic success stories tend to take precedence. The so-called ‘see it, slam it’ attitude that Russia Today pointed to will not altogether disappear. But reporting on the negatives of any Olympics is hardly new and there are now other things for the media to focus on. Valerie Pacerr is a research student at UCL-SSEES. Her interests include Russian foreign policy, the Russian presidency, European security and arms control. She has submitted her thesis which examines the similarities and differences of Russian Euro-Atlantic foreign and security policy under Vladimir Putin and Dmitry Medvedev.